Laser Shot’s NEW Curved Screen Simulators have revolutionized the immersive virtual training industry. 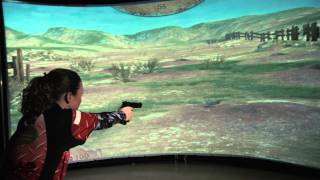 By utilizing a curved, seamless screen, we are able to create an uninterrupted image, offering the men and women of our protective services the most realistic firearms training experience available. 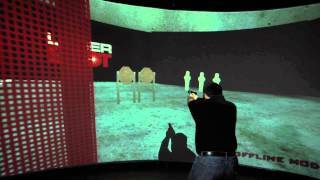 The same proven Laser Shot software for law enforcement and military, who have been training with Laser Shot for years, can utilize this NEW immersive format. Furthermore, the new additions for the Curve are our “Practical Shooting Courses.” Twenty-five (25) challenging shooting courses that apply all fundamentals of shooting in a competitive and creative virtual world. Laser Shot’s Curved Screen Simulators can be made in custom sizes and custom configurations to fit the space you have. We provide both Modular Truss Designs as well as Hard Mount Installs.